To schedule a visit or tour when the church isn't conducting a scheduled open house, call the St. John Lutheran Church at Crabapple rental contact person below or complete our Contact Us form and select St. John Lutheran Church at Crabapple from the dropdown. Include the date/time of your request along with details. The St. John Lutheran Church and Sunday School Building is available to be rented for weddings, reunions, or family events for $150 per day. Donations received will be used to maintain and operate the St. John Lutheran Church and Sunday School Building, cemetery, and grounds owned by the Association. The St. John Lutheran Church building was built in 1897, and worship services were discontinued in 1962. The St. John Lutheran Community Association was organized in 1963, and the Annual Homecoming worship services and celebrations have been held since 1977. Many families living in the Crabapple community originally were members of Zion Lutheran Church in Fredericksburg, however, because of travel distance and other difficulties, they started to meet in the Mathias Schmidt home. When a school building was built in 1877-78, the families met in it, and Pastor Weiss served this devoted group of Lutherans. On April 3, 1887, (Palm Sunday), the first confirmation of six children took place at which time they were accepted as members. In 1888, another building was built for the school and the families held church service there. On April 22, 1890, the people joined the American Lutheran Church Synod of Texas and signed the constitution to become a formal organization named “St. 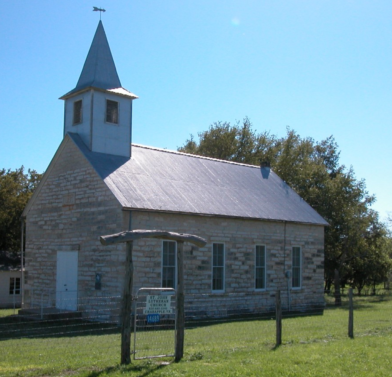 Johannes Evangelische Lutherische Kirche zu Crabapple, Texas”. At the annual congregational meeting held on December 26, 1896, it was approved to purchase six acres of land from August Bruns, and a type of building was voted on. On June 18, 1897, the cornerstone dedication service was held by Pastor Glatzle, Pastor Krienke, and Pastor Haag. With the help of many volunteers, the building was completed in 1897, and on November 21, 1897, the last Sunday in the old church, the new church building was dedicated. Worship services were discontinued in 1962. The St. John Lutheran Community Association was organized in 1963, and Annual Homecoming worship services and celebrations have been held since 1977. The Association welcomes new members.